NAGA is one of the battlegrounds of the ongoing ruckus involving the insensitive and ineffective Government Service Insurance System (GSIS), thanks to a series of emails fired by Elmer Casillan on behalf of his father Silvino, which the Inquirer promptly printed and its columnists, notably Ramon Farolan and Winnie Monsod, discussed. Elmer is an acquaintance, being a mainstay of the local cause-oriented movements when I was still working for Vox Bikol. His wife Marissa -- known as Issa among her Kabulig-Bikol colleagues -- is a former teacher at Naga Central School 2, where my sons and eldest daughter were schooled before I left for my fellowship. She is EK's Grade II teacher, who left NCS 2 because of a principled difference with a former notorious principal, who has since been convicted of a charge that Marissa filed against her. When the late Silvino was finally buried sometime last week amidst a heavy downpour, Angel, one of my city planning colleagues and a classmate of Elmer's elder brother, joined the Casillans in laying their father to rest. 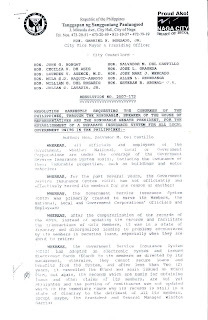 The GSIS, of course, is something all government workers are familiar with for two main reasons: (1) it takes away 9% of their basic pay as their share of the premium, to which their employer must provide a counterpart, and (2) its service has fantastically retrogressed to the depths of hell, starting when Winston Garcia hooked up with the Aboitiz-owned Union Bank and messed things up by introducing the ECard system. No amount of spin and rationalization will cover up the fact that when the ECard and ECard Plus systems were introduced, the total number of claims and loans -- as Monsod's eagle-eyed analysis points out -- went down from 5 million in 2004 to 3.6 million in 2006. This has only fueled speculations that GSIS has actually run out of money to lend out to its members. Sometime before the election, I wrote this post on the ECard fiasco, hoping that senatorial candidates -- including Sonia Roco -- would take heed. Alas, it did not come to pass. Essentially, the resolution calls for establishing a separate insurance system that will service the needs of the country's local government units -- the 80 or so provinces, 130 or so cities (including the newly minted ones, unless the Supreme Court invalidates their cityhood), more than 1,500 municipalities and around 42,000 barangays. If the A Teacher partylist group can make good on its thrust to establish a separate insurance system for the 500,000-strong public school teachers, it will surely bring the GSIS and Winston Garcia down on its knees. The precedent? I understand the PNP and the AFP already have their own insurance systems independent of the GSIS. I don't see any reason why we shouldn't do the same for LGUs and the DepEd, in the face of the latter's continuing failure to provide effective and efficient service to its clientele. They are also proposing to include the centralization of the TPL of the LTO under the supervision of the GSIS. Here is a link to a blog which writes about the shortcomings or disservice of the GSIS. Its in my blogroll as well, At The End Of The Day - Pierce. Another critic of the GSIS plan regarding the TPL is Inquirer's Honesto General, who comes from Naga. I don't agree with him sometimes, but insofar as insurance is concerned, he's the man.